The floral is a polyester slithery fabric, and the teal is rayon knit. It used just 40cm of each, and took about 20 minutes (max) to sew. 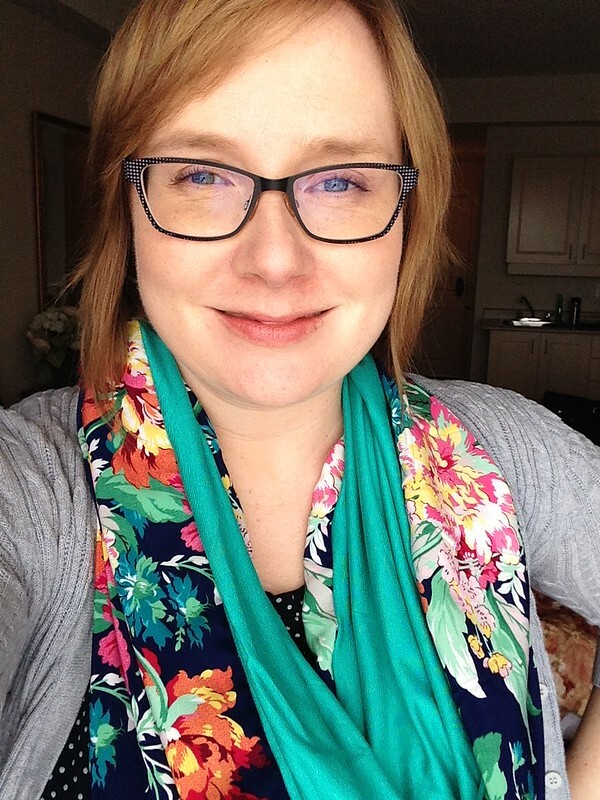 I have winter scarves with this combo of navy, pink and teal, but I wanted something that looked spring-like that would still keep me warm while the weather is below freezing! 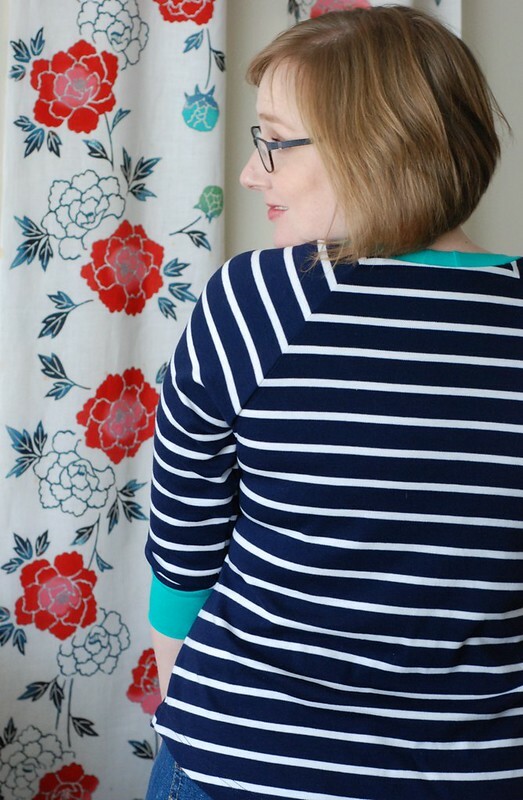 Stripe matching on raglans is so satisfying – even if it is secretly really easy! I don’t really worry about the stripes when I cut. Instead, I just slide the arm piece up or down the body piece until they align. That means the neckline and armpit edges don’t match up perfectly, so one or the other piece needs to be trimmed… but on a stretchy t-shirt a centimetre here or there doesn’t really affect fit. That’s my theory, at least! I’ve got enough lace to do a front or back of a shirt, but I’m worried because it has no stretch. Have you adapted a knit pattern to use a woven for one part? How much more ease should I add? Or is it better to start from a woven pattern with a dart? These are the mysteries of my life, people. Help me out, please! One of the suggestions included in the Camas instructions is to skip the buttonholes, and just sew the buttons on through both bands — the top will slip easily over the head — which is a great way to sidestep the fear :D. I’m definitely planning on that route since the one I’m currently making is from slippy rayon knit. This is a really nice colour combination. I love the lace detail and the matching cuffs. Your scarf is lovely. The polyester fabric is a beautiful pattern. I love what you did with the lace! Great job. Um, I’m experimenting with woven/knit combos too… such mysteries. My guess would be if you used it on the back with a stretch front it might work. You would probably need darts to give it shape if you used it on the front as well as adding ease. Interesting dilemma. I look forward to your results! Using the acae on the back is a good idea! I was picturing using it on the front, but bewbs will just make it more complicated. I’m curious to see your results too! 🙂 Hadn’t even thought of that, but you’re right of course! Love what you did with the lace, lovely! Love the addition of lace on this top! The colors are really great too. Around these parts, the kids have Christmas break, February vacation and April vacation… the Feb vacay is particularly irksome since they usually have several snow days late Jan/early Feb. The poor teachers complain that it’s hard to get any momentum going with all the days off, then the school year is extended until the end of June. Two breaks in the spring, and none in the fall? That seems unbalanced! We have a lot of snow days too, depending on where the school is, but they don’t get added to the end of our year. How can you plan vacation stuff if you don’t know when school will end? That’s tough! Even though I’d seen that top before it still made me squee a bit. Love the color combo and the lace. I”m so excited about colour now tat it’s (at least technically) spring. Why do I let winter depress me into wearing darker versions of the colours I like? 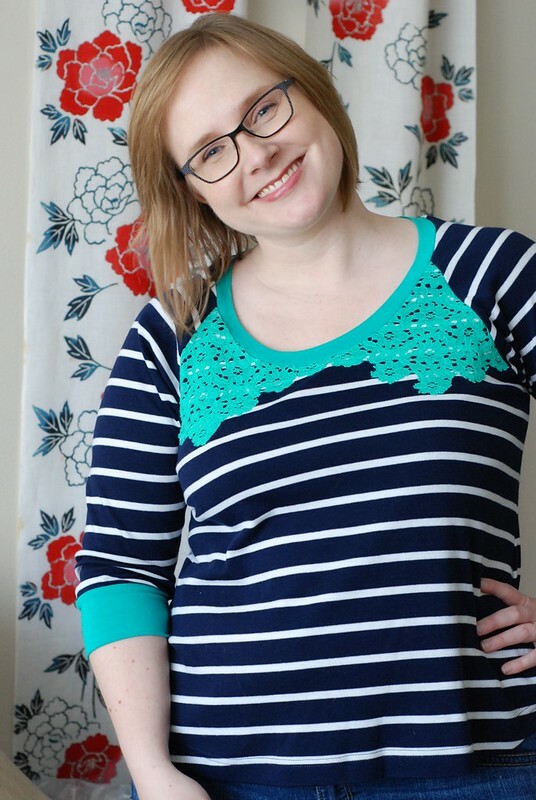 I love this top with the teal lace and the stripes – such a great combo!! I love how you did the lace appliqué too! When I did my lace front Linden I didn’t add any ease at all. To be honest, I never even thought about it. The lace is a plain cotton with no stretch and I cut it the same as the the regular front piece, and then I just sewed them up together as if they were one. It worked and has washed well. The linden is not super fitted though, so it might be different with a more fitted top. Ok, that’s good to know! I liked your lace Linden a lot! Thank you! I make so many boring basics that I’m trying to push myself a little this spring to add extra things to make them more fun! Thanks for the tip! I think if I added a bit at centre front and maybe a bit under the arms I’d be ok with a lace front? I know I said this elsewhere, but I really like the lace detail on the shirt. Takes it up a notch with little extra effort. beautiful combo! 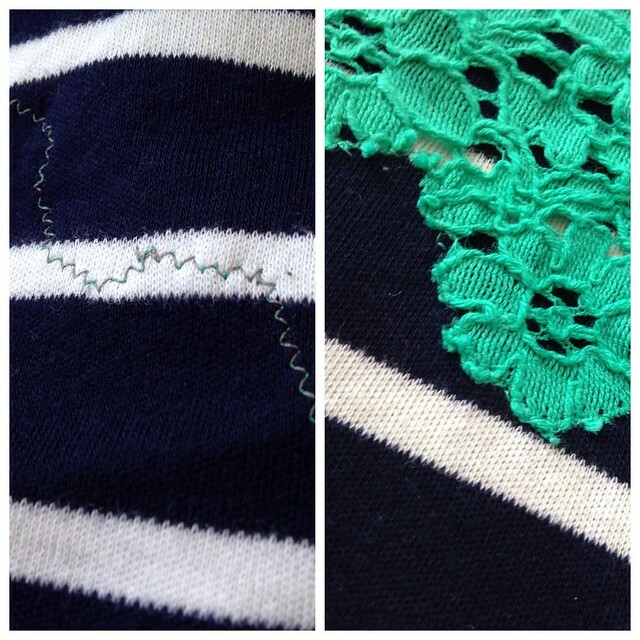 i always go reverse– use a smaller woven pattern for a knit fabric. so no help here– but i like the idea of using it on the back, way less stress! Seriously, I may not have sewn a dart in over a year. Lace on the back might be the way to go! Pretty! Love the green lace. And yes, that knit was an awesome thrift store score! I should have bought the other strip fabric at the thrift shop that was navy and teal! Why, why, why didn’t I? SIlly me. Great idea, I love the lace trim on your sweatshirt. I’m going to try that.